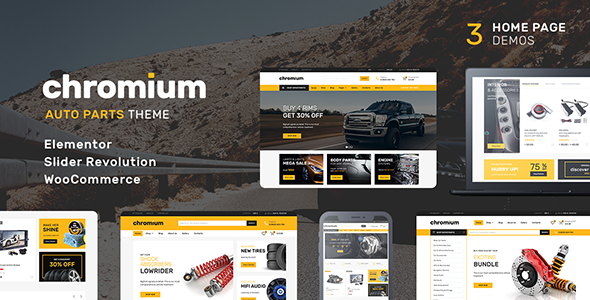 Chromium is a great premium auto parts WordPress theme. We designed it to make your site prettier and your life easier. The theme is fast, modern, and features great plugins and theme options. Why? Because they facilitate the process of theme tuning. This WordPress auto parts template comes with easy demo data installation system, thorough documentation, and at least 6 months of the personal one-on-one ticket system support. Our professional and caring support specialists will be glad to provide you with all the necessary help and support regarding the auto parts WordPress theme. As a result, we get a great ready to use theme your customers will love, and you will love it as well. Chromium is a beautiful and solid foundation for your automobile parts website. We encourage you to contact us if you have any questions. Chromium Theme supports Elementor as a default content builder, thus allowing you to create stunning pages quickly with no coding skills.